Braces can have dramatic, positive effects on a person’s life. Not only do they correct noticeably misaligned teeth and gaps, but they can also improve oral health, make brushing and flossing easier, bolster confidence, and even correct bite problems. At First Line Dental, we’re proud to feature the services of an in-office orthodontist, Dr. Ji Young Lim, which saves you and your family an extra trip to separate dental offices and helps everyone stay comfortable with a team they already know and trust. Ready for a FREE consultation? Please contact us today in Manchester, CT.
Why Choose First line dental for Orthodontics? Invisalign is a popular orthodontic service among teenagers and adults here in Manchester. This modern treatment style eliminates the “bracket and wire” braces system entirely, replacing it with clear, comfortable aligners that each represent a different stage of tooth movement. These subtle aligners will be missed by virtually everyone you interact with, making them very image-friendly, and their removable nature also means you can continue enjoying all your favorite foods without restriction. Schedule a free consultation to see if Invisalign is right for you. 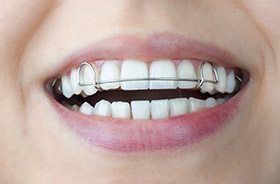 Metal braces have been a tried-and-true orthodontic solution for many years, and they can be used to correct even the most severe concerns. At First Line Dental, we provide braces for both children and adults. Traditional orthodontics consists of three separate components. The brackets are directly bonded to the front surfaces of certain teeth, and the archwire serves as the catalyst that attaches over them and applies consistent pressure. The brackets and archwires are connected to one another through the use of elastics (rubber bands), which come in a wide variety of fun colors. Sometimes, orthodontic problems can start to manifest in patients from a very young age– that’s why Dr. Stanko performs comprehensive dental evaluations on a routine basis for the entire family! 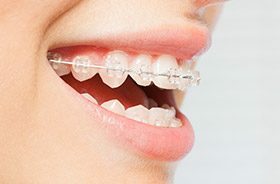 Instead of waiting until children are old enough to start wearing traditional braces, he may recommend Phase 1 Orthodontics as an earlier starting point. Each Phase 1 plan is unique and could feature removable appliances, space maintainers, and even guided intervention for harmful habits like thumb sucking, depending on the patient’s specific needs. 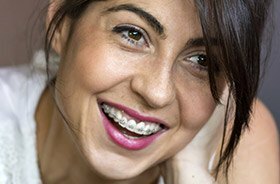 Many older teenage and adult patients are in need of traditional orthodontic treatment but dislike the idea of wearing traditional metal braces throughout their treatment. 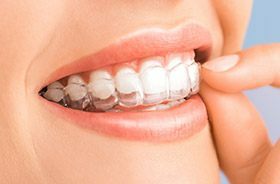 Thankfully, a good compromise is available here in Manchester, CT – clear/ceramic braces. This style of orthodontic treatment has the same basic components of traditional braces, but they’re either clear or tooth-colored, which means that they blend in very well with your natural smile and are hardly noticeable in everyday life. There are several types of orthodontic appliances that may become useful for children and adults over time. 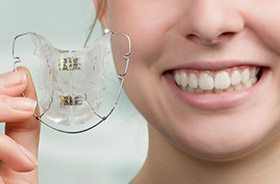 The most common one is removable retainers, which are highly recommended after a patient has completed their treatment plan. Its regular use will help prevent teeth from gradually shifting back towards their original positions and undoing your hard work. Additional options include palatal expanders (used to widen the patient’s upper jaw), thumb appliances (used to deter thumb sucking in children), and more.